Tom Wänerstrand began his journey with Wizards of the Coast in 1993 illustrating cards in his spare time. These days he guides the team responsible for the production of Magic, amongst other things. When last you heard from me, I was rambling on about coatings, with a focus on the finishes that we apply to the faces of our cards. In this installment, I would like to speak further about the stuff that is literally at the core of that Magic card in your hand—the paper. Of course, Magic paper is no ordinary paper. It is playing card board. We use this style of paper (also referred to as stock) because the performance requirements of a playing card are different from your average game piece. While you might not choose to riffle shuffle your favorite Magic deck, you certainly could, as our playing card board is designed to bend and shuffle without creasing or otherwise damaging the stock. How is this possible? Because most Magic paper is actually two sheets of special paper of a specific thickness and weight that have been laminated together. This construction is what gives the board it's "snap," a term we use collectively to describe the paper's pliability, rigidity, and strength. In the center is a special glue, and in the case of our proprietary Magic stock, that glue center is blue. The primary purpose of this dark colored center is another of those specific playing card requirements—opacity. 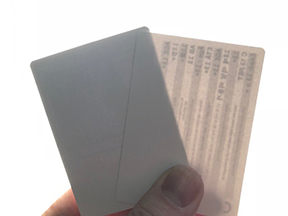 Even reasonably thick normal papers are somewhat transparent when held to the light, and you certainly don't want to be able to see through your cards during gameplay! Playing card board on the left versus unlined stock of the same thickness on the right. 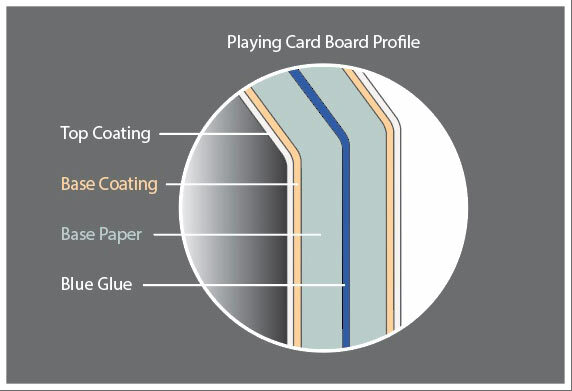 Another often-overlooked element of a good playing card board is the surface coating. Paper coating is different from print coating in that it is applied in layers and calendered (polished) at the mill during manufacturing to achieve a desired surface. The properties we are most interested in this coating are whiteness, gloss, and smoothness. For Magic, our papers are matte (as we do not want excessive glare) and have an even, smooth surface for printing. This surface works in tandem with our print coatings to achieve a specific look and feel. Different levels of gloss on a Masterpiece Series card. 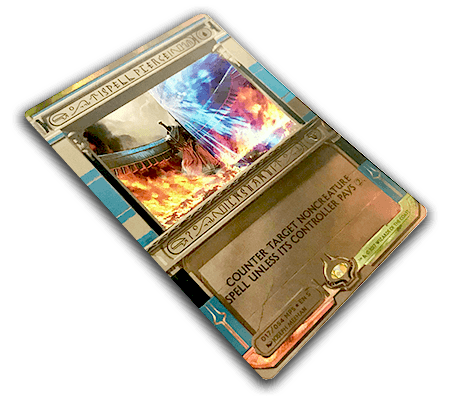 That's the technical construction of a Magic card, but I know it's not what many of you came to this article for. I have read a lot of interesting theories, especially since my last article, about how we have changed our Magic stock over time. For the primary stock, I am here to tell you that the specification has not changed. Our primary proprietary Magic playing card board is the exact same specification it has been since 1993. Same thickness (or "caliper"), same basis weight, same core color, same manufacturing process since the beginning. Not to say that there haven't been differences. Paper is a natural product, and because it is made from different natural pulps, no two paper sheets are exactly identical. But improvements in technology and process insure that the sheets being produced today are more consistent than ever. Another cool fact is that our primary board has been made at the exact same French mill since Magic was born. In addition to being the birthplace of Magic card stock, This mill is a sustainable facility. It generates its own energy from the waste it produces! Of course, Magic paper is sustainable too. All of the pulps used in our playing card board are 100% FSC certified sustainably harvested. Despite this history and great advances in process with our long-standing paper, we have continued to look for improvement—that next generation of playing card board. Two years ago we worked with our partners to develop and qualify an additional Magic stock for our Japanese market. This stock is unique in that it has a different multi-ply construction, which retains all of the technical playing card board characteristics but combines them with added dimensional stability. We were even able to build in some recycled content into the certified pulp for this board. Although originally exclusive to Japan, we have been working to expand the reach of cards produced on this stock. In fact, all players worldwide will have a chance to check out this paper with the upcoming Battlebond release. I hope you found this look at playing card stock interesting. When I return next, I will show some of the behind the scenes process of how we take a card from a bunch of digital parts on the computer screen to the printing press.